Every returner for the long jump and triple jump, this past season's indoor stats, AND who is the combined marks King and Queen. Nils Wildberg was second in the long jump at the Meet of Champions last spring and leads the state into the 2019 season. Despite missing some time due to a winter knee injury he is coming off winning the first ever indoor long jump Meet of Champion showcase. Richmond Sasha of Hamilton West leads the triple jump with his 48-03.25 and was fourth at MOCs last year. For the girls both Meet of Champions winners are back again. Tionna Tobias leads the state overall from 2018 with her 19-11.5 but also is the defending MOCs champ thanks to her 19-05.25 that day. 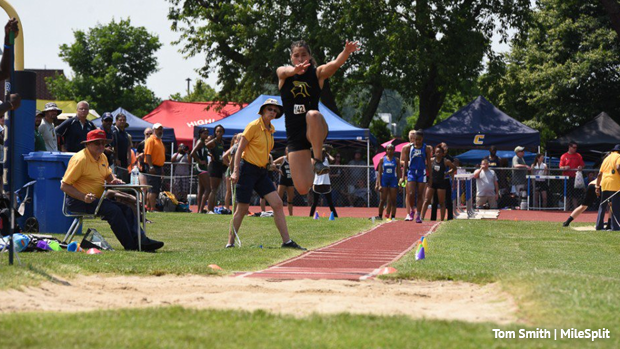 Tiffany Bautista had an absolutely amazing MOCs last year and the triple jump victory was just a part of it, she hit 40-02 that day and had a season best of 40-06.75. That was just a quick rundown of the NJ#1 returners statistically from last spring, plenty of new challengers to be found through the indoor rankings this year including freshman Leah Ellis and the indoor MOCs winner Nakaja Weaver. Also check out who has the best combined long jump and triple attack based off their 2018 spring stats.